“We want the trustees to really consider what is smart for the community,” said Brittany Bowers, a member of a group of Harlem Township residents who are rallying against the rezoning of a property for a proposed 500-unit storage facility on Fancher Road. The group plans to attend the next township trustees meeting at 7 p.m. Wednesday in township hall at 3883 S. State Route 605, Galena. 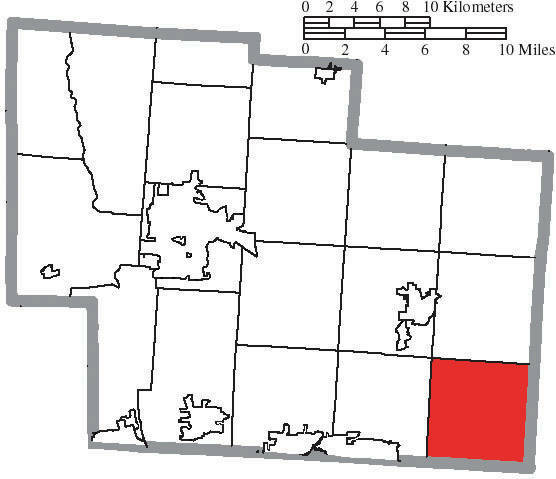 A map of Delaware County highlighting Harlem Township (in red). 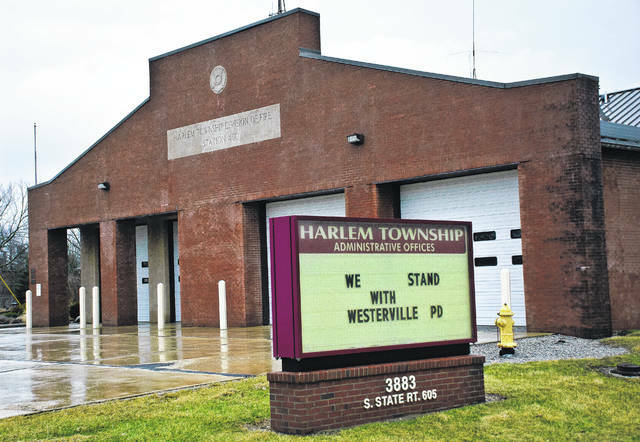 A group of Harlem Township residents has banded together in an effort to “rally the troops” for Wednesday’s (Feb. 21) Harlem Township Board of Trustees meeting. Trustees will consider and possibly take action on rezoning 13 acres of land to a Planned Commercial and Office District. The request has already cleared the township’s zoning commission. According to the residents who own property near the land being considered for rezoning, the proposed use is for a 500-unit storage facility on Fancher Road. Residents said the land is currently zoned agricultural. Bowers said if the proposed rezoning takes place and the storage facility is allowed to be built, the facility plan shows an 800-foot privacy fence that will run along her driveway. According to Bowers, Harlem Township is supposed to be a lower-density community. Maintaining property values is another concern of Bowers. Bower said the people proposing the storage facility are not from the area, but live in Lancaster and Blacklick. “They’re not part of the community, and they’re not invested in the community,” she said. Susi Perry, a resident who lives across the street from the property, said the proposed storage facility will be a kiosk and unmanned. “There won’t be any income taxes collected,” she said. Perry said she has investigated other storage facilities within the area and found many are not at capacity. “It’s not needed. It’s not necessary,” Perry added. According to Herman (Judge) Berk Jr., people are concern about possible criminal activity and then hiding in the outbuildings and barns of the surrounding residents. Berk said the parking and storing of motor homes and boats will only lead to the theft of generators and boat motors. Berk said the lights will be on 24 hours a day. He said the residents moved to the country to get away from the lights. The Harlem Township trustee meeting is to be held Wednesday, Feb. 21 at 7 p.m. at the township hall, 3883 South State Route 605, Centervillage. https://www.sunburynews.com/wp-content/uploads/sites/48/2018/02/web1_DSC_0598.jpg“We want the trustees to really consider what is smart for the community,” said Brittany Bowers, a member of a group of Harlem Township residents who are rallying against the rezoning of a property for a proposed 500-unit storage facility on Fancher Road. The group plans to attend the next township trustees meeting at 7 p.m. Wednesday in township hall at 3883 S. State Route 605, Galena. https://www.sunburynews.com/wp-content/uploads/sites/48/2018/02/web1_Map_of_Delaware_County_Ohio_Highlighting_Harlem_Township-copy.jpgA map of Delaware County highlighting Harlem Township (in red).